Hey @Troodon80! When I select my, ah, 00546 folder as the installation directory EE keeper doesn't find the correct save game files. Can you fix this? @Mormont, in what way is it not working? Did you also set the language? Where is the option to set the language? I just see the option for the installation directory. EDIT: Ah lol, i have to apologize MY mistake! Found it and work well! The the installation directory goes first, followed by selecting the language (where the TLK file is located). @Mormont, glad it worked out . I've edited the second post on the first page just in case someone else has a similar problem. By the way they're installed in this exactly order. Now, every time i try to open EE keeper, the program stop function before even load it entirely, so i can do nothing to fix the problem by myself. The problem comes from FoF. Feature request: Could you consider adding a dialogue to add affects? At present, it is only possible to duplicate existing ones or copy/paste from a different file I.e. if there are no affects to begin with there is no way to add them. @ambrennan, that's something we'll certainly get to eventually . Wanted to post quick to say this works *great* and suggest a name: Shadow kEEper. Get it... EE. *cough* Anyways, thanks for all your work. Followed everything and successfully installed EE Keeper. There's a bug though when you install mods. After you install the mods and start EE Keeper, 1) it doesn't show my portrait (which is understandable since I have a custom one, but should I also be able to see even custom portraits? ), and 2) when I proceed to the next character, a text box opens saying "enter an integer between 0 and 1,000,000,000 (enough zeros i think) -- which is weird because all the slots are properly filled out. I just click "OK" and the text box just comes back but this time crashes the app. Before all this, there was another text box that appeared after loading my save file. "Some files in this file were not found in the app *something something*," nonverbatim. Sorry, can't remember. If anyone has a solution, it would be awesome. @yzane, sorry, but I don't actively support Mac. While it is possible to use it with Mac using @Nifft's Wineskin'd download, I'm afraid I cannot help you much. Yes, you should be able to view custom portraits - that has only been tested on Windows, however. Mods are generally supported by SK/*Keeper. However, I cannot offer support for problems that arise from individual mods (given the vast quantity). I would offer to take a look but, unfortunately, I don't have a Mac that I can install BG:EE on (which is to say that the MacBook I do have access to is for work only). 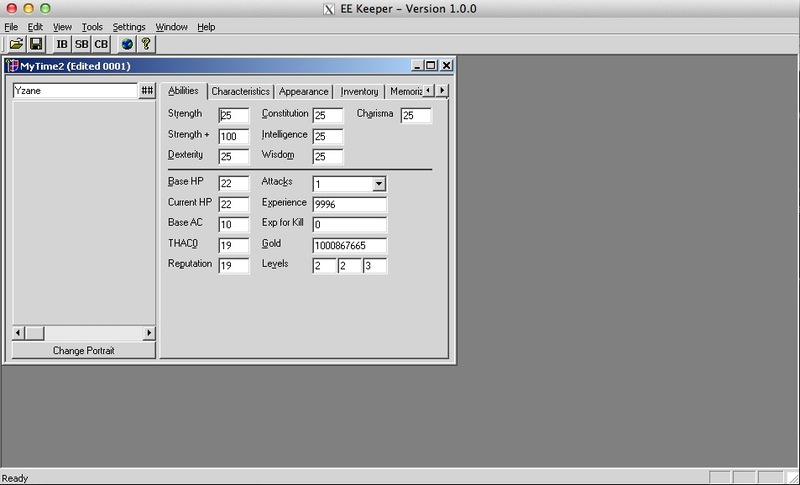 I'll try out the mods and *Keeper on a Windows machine and see if it may be a problem with one of the mods. Other than that, I'm afraid it's going to be up to Nifft. If he can't replicate the issue, then you may be out of luck. Edit: BP Series Party AI Scripts 0.3071 is not installing for me. Another edit: Could you post a screenshot of your Keeper error? Yet another edit: how much gold does your party have? 3rd image: I click OK, the pop-up start blinking (opening and closing, I suppose) and once I click OK for a second time, that black pop-up appears. 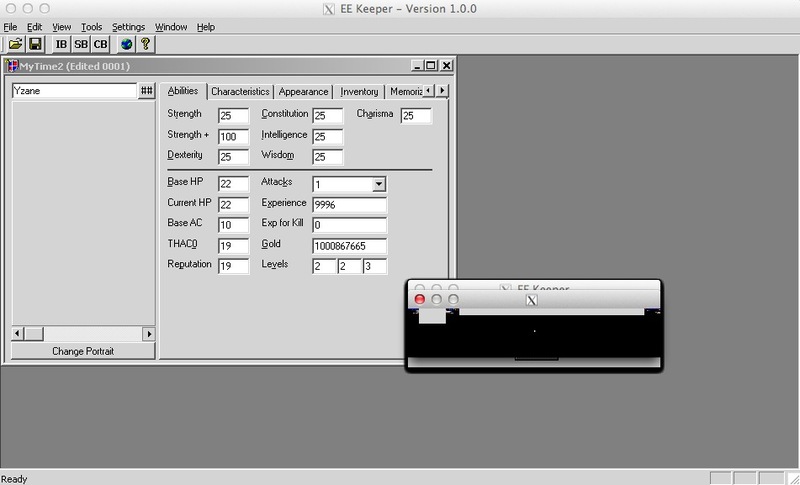 Then, freezes Keeper. @yzane, the problem in this case would be the gold, reduce that and it should be fine. Like I said, I cannot support Mac because I cannot replicate issues that only occur on Mac (due to third-parties such as Wine/Wineskin). I can only assume that this might be something to do with the focusing on the edit box that usually occurs, although I have no idea why it would be displaying the blank popup you are getting in the last image. Also, I noticed that you are using v1.0.0. I made some changes to the portraits detection in v1.0.1, so that might be the reason you can't see them. Could you try updating to the most recent version (I don't know if Nifft wrapped the latest version)? @Heas & @ambrennan, already implemented that - just haven't given you the updated version . This is an update as to what's currently happening since people are asking again. Things are currently slow with EE Keeper right now, but work is still progressing on the original MFC code. It'll be 1.0.2 when it is uploaded, but I currently have no time-line for that release. Given the lack of a date in mind, I'd like to take the time to get some feedback, suggestions, and ideas. There are a few minor features I have in mind, some are already implemented while others are only in a planning stage. There is now a new button on the Affects tab, labelled 'New', for example. This sets a number of the Unknowns to 0xFFFFFFFF, so it will be up to whoever wants to use it to find out the appropriate values. There is now the option to set your Morale and Morale Breaking point - I may implement others in the future if I deem them 'suitable' (i.e. keeping down complexity for non-modders - which is also why I won't be including the option to switch scripts). I am also looking at including a list or selection box so as to allow users the ability to add predefined Affects to any character. Some new tweaks to the interface, too, provided all goes well (not ready to show them just yet). This may or may not happen, but I may keep some of the tweaks for Windows and trim it down for compatibility on other platforms such as running through Wineskin on Mac. Bugs that are still ongoing are the dual-class / multi-class bug, a few memory leaks cause by the original code where it didn't close certain files, and a few other miscellaneous critters as I try to improve performance for WinXP and up. Is it possible to give the stat screen an option so we can reroll to get our preferred stats? like the game does for pc's? This is something else I'm looking into. I have the core code down, and I'm hoping to include a function to allow the re-rolling of stats on the next build. I'm curious as to what people think in how this would be best handled; 3d6 for each attribute (+/- any bonuses or penalties) - take what you get, best of x number of rolls, etc.? Perhaps adding options to re-roll individual attributes? EEKeeper is unable to read the text resources. 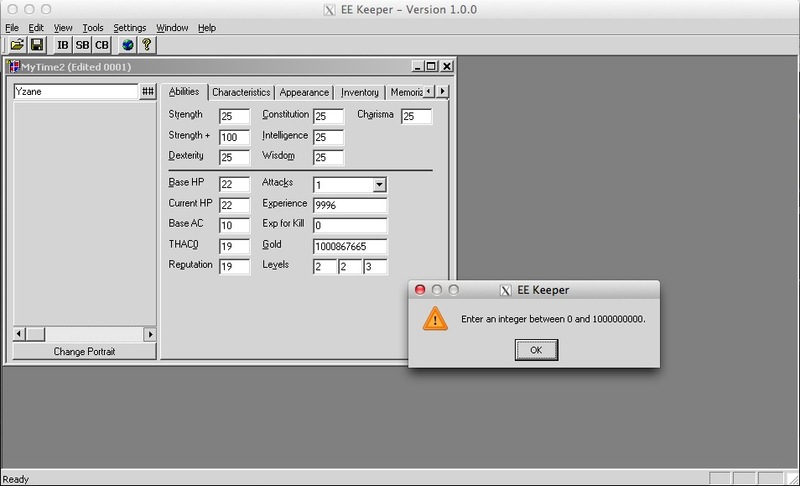 EEkeeper must be able to find this file to work properly. Make sure that the installation path has been set to the correct diretory and restart the EEkeepr. This is mi installation path, and the language....what i'm doing wrong? @SinaFai, what's in Baldur's Gate enhanced Edition\Data? Is there a 00766 folder? If so, then you need to point to that instead. You need to point it to the location of the BGEE.exe/Baldur.exe (Steam uses BGEE, I think) executable. If it's in then directory you have shown there, then EE Keeper should work. WIth ShadowKeeper, all worked fine as described at that post (i.e., found the resources, loaded the resources, and opened the savegame). With EEKeeper, first thing is that I didn't have to move files, as it was already looking for the dialog file at the right folder. It loaded the resources fine, but didn't find any of the savegames (the list was empty). Is it looking for saves at a different place than before? Oddly enough, I was just typing up a message in that other thread. Please be sure that the save games are in in Documents\Baldur's Gate - Enhanced Edition\save\. Which is where they are normally located with the standard Windows installation. The most likely place you have them is in the game directory. If you have a folder called 'save', copy that to Documents\Baldur's Gate - Enhanced Edition\. 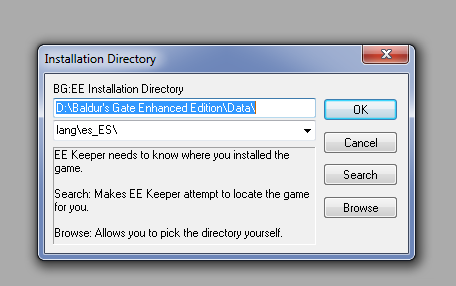 If you don't have the Baldur's Gate - Enhanced Edition directory, you will need to create it manually. If that doesn't work, then you'll need to upload a sample save game for me to look at. @Troodon80 No, the savegame is not on a folder with that name. As I had to open up the .ipa, I extracted the game to a \Baldur folder, and them using iFunBox copied the savegame from the iPad to a "save" subfolder. Besides, I am on a Mac, does it looks for the "Documents" on a Mac too? The original ShadowKeeper found the savegame on the "save" subfolder, after I pointed it to the game main folder. Why doesn't EEKeeper do the same? @leomatheus for the Wineskinned Mac version, you'll need to ask @Nifft. I assume it does, though. @leomatheus - I haven't tried hacking the iPad version, but an idea would be to put a symlink where the usual Mac save folder would be, that would point into the iPad file structure. I was trying to make EEKepper to work with the steam version i own, i simply made a copy of BGEE.exe and renamed it to Baldur.exe and EEKepper worked. dunno if someone posted this somewhere else but i think i should share it since i didnt found a solution for that in this thread. That's as good as anything. It won't matter in future versions, though, as it will look for the chitin.key file instead of the executable file. That should also help cross-platform. Thanks for pointing it out . I've noticed something odd when displaying proficiencies. If you're looking at your PC (or at least when *I* am looking at *my* PC) all the proficiencies show up under the Class 1 column. But when I'm looking at an NPC (say Minsc or Jaheira) all the proficiencies show up under the Class TWO column. Seems odd ... not sure it affects anything in any sort of practical manner.